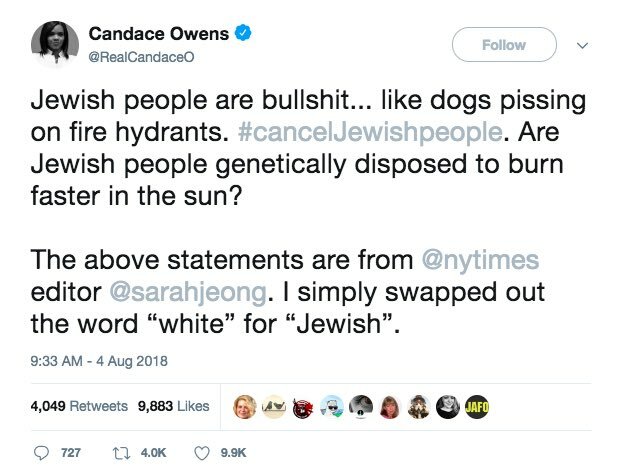 Conservative activist Candace Owens quoted newly hired New York Times’ writer Sarah Jeong’s anti-white tweets but replaced “white” with “Jewish” to show how such comments would never be tolerated if it was any other race in the crosshairs. She was immediately suspended from Twitter as a result. It was definitely a mistake, but not in the way they’re describing it. The mistake was showing their anti-white bias. The tweet is no longer up on her account but her access has been restored.